Update: AP article here. They made their decision based on Obama's election to the Presidency. My translation: They don't want to be moved to federal court where they would be more likely to get life in a Supermax prison than the death penalty, and if they got the death penalty, face years in prison before it was carried out. "What should have been a major victory in holding the 9/11 defendants accountable for terrible crimes has been tainted by torture and an unfair military commissions process," said Jennifer Daskal, senior counterterrorism counsel at Human Rights Watch. "These five men are known to have been mistreated and tortured during their years in CIA custody, including the acknowledged waterboarding of Khalid Sheikh Mohammed." 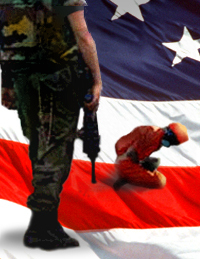 A military judge today dismissed the charges against Guantanamo detainee Mohammed al-Qahtani. The Pentagon had claimed al-Qahtani was the "20th hijacker" for 9/11. He had been subjected to harsh interrogation techniques. The charges against five other detainees, including Khalid Sheikh Mohammed were approved. They face a possible death penalty. The Washington Post reports that the Bush Administration says it is unlikely that trials of any of the Guantanamo detainees will take place before Bush leaves office. Nearly seven years later, however, not one of the approximately 775 terrorism suspects who have been held on this island has faced a jury trial inside the new complex, and U.S. officials think it is highly unlikely that any of the Sept. 11 suspects will before the Bush administration ends. Though men such as Khalid Sheik Mohammed, the alleged Sept. 11 mastermind, are expected to be arraigned in coming months -- appearing publicly for the first time after years of secret detention and harsh interrogations -- officials say it could be a year or longer before worldwide audiences will see even the first piece of evidence or testimony against them. Now, as the murky, quasi-legal staging of the Bush Administration's military commissions unfolds, a key official has told The Nation that the trials are rigged from the start. According to Col. Morris Davis, former chief prosecutor for Guantánamo's military commissions, the process has been manipulated by Administration appointees in an attempt to foreclose the possibility of acquittal.